Did you know it is now possible to get the train direct from London to Marseille? Marvellous Marseille is somewhere I have been lucky enough to visit several times, and I have always flown there. So, when Eurostar launched their direct London to Marseille service and I was planning a trip with a girlfriend (who is afraid of flying), it seemed too good an opportunity to miss. It’s easy to let the UK’s island status make you automatically look for flights whenever you wish to leave the country. Flights are generally inexpensive, making them tempting, but there are also plenty of overseas trips by sea and rail on offer, with journeys less arduous than you might imagine; travelling to the French Mediterranean coast is one of them. While our 07:19 departure was a tad on the early side, catching just one train all the way to Marseille was a super convenient direct service. Having got onboard and stashed our luggage, we sat back and relaxed. Completing a journey of 1,250 kilometres such as that from London to Marseille without a connection is unusual. Since the completion of the Channel Tunnel, rail-travelling Brits wanting to visit the French Mediterranean coast have needed to change to the TGV line in Paris. We really appreciated not needing to get off the train, drag luggage around a busy and unfamiliar station and board a new train. It was so easy. The first 40 minutes or so we skirted around London, passed through the Kent countryside, then spent around 20 minutes under the Channel, and the large flat fields of northern France welcomed us to the continent. 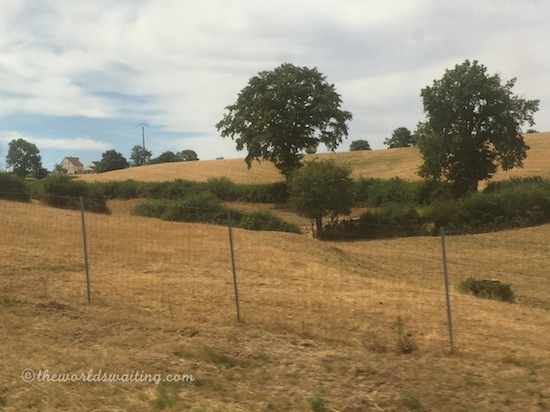 We passed through the slate-roofed Calais region and headed diagonally across France and it’s wide expanses of sloping countryside, to Lyon. From urban Lyon we went south through fields of sunflowers and past the Rhone at Aix-en-Provence and on to Marseille. During the journey passenger announcements included tourist information and we were informed of the various industrial histories of towns we passed through and significant landmarks were pointed out. One of the stewards even walked through the train with an iPad sharing further information on cultural sites with those who were interested. As we approached Provence the Alps rose majestically to the eastern side of the train, transforming the landscape, which had mainly been wide, open fields until this point. Shortly before arriving in Aix-en-Provence we were warned we would be able to see the Palais des Papes as we crossed the river, and it looked enormous! From Aix it was only another hour to Marseille. We arrived in Marseille Gare St Charles just after 3pm local time. Our train journey from the centre of London to the centre of Marseille took about seven and a half hours, including check-in time at St Pancras station (six and a half on the train). The quickest journey you could take by plane would probably take around six hours, including transport between airports and cities, and check-in times. The train can also be cheaper than flying. Return tickets from London to Marseille are advertised for £99. If you include the cost of getting to the airport with your flight price, it will probably cost more than going directly from one city centre to another. 1. Expect full luggage security scanning (the same as airports) before departure, ensuring you can remove laptops easily before the x-ray machines. 2. Print your boarding pass at home to save time at your departing train station, which is important as you have to go through security, British immigration and French immigration before departing, all during a shorter period than if you were at an airport, and there are often queues. 3. Board your train as soon as possible once it has been called as boarding can be denied in the last minutes before departure to ensure services run on schedule. 4. If you want to eat on the train, buy your food as soon as possible as the onboard shop only carries limited stock and closes about half an hour before arrival at the final destination. 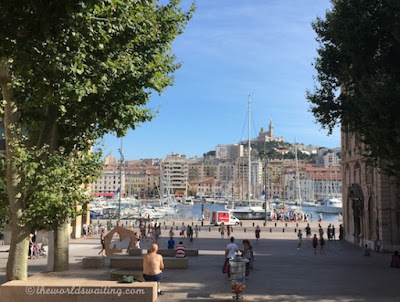 While flying into Marseille offers travellers magnificent aerial views of the city nestled between the Alps and the Mediterranean, travelling by train was very easy and inexpensive. I enjoyed being able to see the country I was travelling through which is an obvious benefit of surface travel over air travel. Another advantage is the fact that less time is spent hanging around waiting for departures. If you want to work while travelling, or prefer to settle in and get comfy for the trip, a bit longer onboard and less time waiting in between is an advantage. I hope lots of travellers take advantage of the direct London to Marseille service, as hopefully the more people use them the more these convenient services will be provided. To my mind at least, the more methods of transport available the better! Have you travelled by train to the south of France? What did you think?